K-117 Bryansk is Project 667BDRM Delfin nuclear-powered ballistic missile submarine (SSBN). The submarine was laid down on April 20, 1985 at Sevmash shipyard (Severodvinsk) under the name of K-117; launched on February 8, 1988; commissioned into Northern Fleet on November 9, 1988. The sub obtained the name of Bryansk on January 27, 1998 when Bryansk city administration took her under patronage. On July 31, 1994 the sub surfaced near the North Pole. 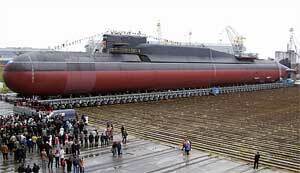 Since Nov 2002 till Oct 10, 2007 the sub had been under repairs and modernization at Zvezdochka shipyard, Severodvinsk. The submarine is armed with four 533-mm torpedo tubes; 16 launch tubes of R-29RMU-2 Sineva ballistic missiles; MANPADS 9K310 Igla-1 or 9K38 Igla launchers.